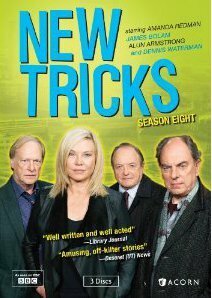 Those lovable lads from UCOS (Unsolved Crime and Open Case) are once again wrangled into service by Detective Superintendent Sandra Pullman (Amanda Redman) in the eighth season of the beloved series New Tricks. The three retired detectives take a look at old and unsolved cases with a view to finding a resolution. The stylish boss superintendent Pullman gives orders and suffers no fools as the team reviews files, interviews suspects and hunts down killers in this charming and long-running series. This set includes all 10 episodes from Season Eight, which was originally broadcast in the summer of 2011 (Season Nine is currently running on the BBC). These are the unedited UK editions, showing an additional six minutes per episode than was broadcast by PBS stations in the US. There are plenty of contemporary touches and modern events that help to keep the series fresh. The three detectives are also amusing as they attempt to solve cases and sort out their personal lives at the same time. The three detectives are: Jack Halford (very refined and dapper), Brian Lane (full of facts no one is interested in) and Gerry Standing (always with an eye out for the ladies). It's also fun to see the occasional famous face pop up from time to time. Some of the actors making guest appearances include Peter Davison, Keith Allen, Rebecca Front, Shaun Williamson and Sally Phillips (among others). There is also a 20 minute extra feature on how the soundtrack for the series is put together. It's really fascinating and shows just how much work goes into something most people take for granted. There's a discussion of how the sound effects (walking, doors closing, bicycle wheels turning, etc.) are added after filming, and a fascinating interview with the father and son team responsible for creating the music for each episode. I was surprised to learn that Dennis Waterman really does sing the "feem tune!" The series has already been renewed for a tenth season, so it looks as if the UCOS team will be solving mysteries for a while to come!